What they say: Our world is being judged and we remain unaware. In a world filled with people, Gabby is uniquely alone. The tiny glowing sparks filling her mind that represent the people around her, confirm it as does the bizarre inexplicable draw she has on men. Walking the dirt path toward the door, which I realized I’d tread over several times in my socks, I saw a peculiar shadow on the ground melding with the shadow of the still open door. Looking up at the space behind the door, I saw the flash of eyes just before a man stepped out into view. I froze. My stomach dropped and my heart did a strange little flip. Before I could take my next breath, a shiver ran up my spine and gooseflesh rose on my arms as my anger spiked uncontrolled. “You have got to be kidding,” I whispered to myself without thinking. I’d been so close to escaping. His filthy long dark hair trailed in front of his eyes shadowing his face into obscurity. An old dull-green army jacket hung from his frame as filthy as his hair while his bare feet shone pale against the black sweats he wore. I couldn’t tell his age, the color of his hair, or the color of his eyes through the tangle of hair, but could see the glint of them as he moved away from the door stalking close to me. I remained frozen, trying to deny the significance of the encounter as my stomach continued to do crazy little flips. Just before he reached me, he turned away and walked around the corner of the building, heading not into the woods as the rest had, but to the front of the building. I stared after him, momentarily confused. I struggled to think coherently to get my feet moving again, my thoughts jumbled. He’d recognized me. Just as I had him. Why had he turned away? Did it matter? Move! Escape before he changed his mind! Finally lurching toward the door, I said in a rush, “Sam, I’ve more than fulfilled any obligation I had to you or the pack.” The Elders stepped aside before I bowled them over. “I’d like to leave tonight,” I added walking past him and the other Elders. I didn’t wait at the door but walked through the Introduction room to the interior hall, pausing only to pull off my dirt-caked socks. Charlene would have me cleaning floors if I walked through the halls in my dirty socks. Maneuvering through the fortuitously quiet and empty halls, I struggled to control my emotions, or at least tamp them down. Over the years, I’d learned control, knowing those around me would be able to smell things like fear, anger, lust, or even sadness, but tonight all that control evaporated. Anger and fear swamped me. Anger at Sam for arranging the whole damn thing and fear that the Elders knew what just happened. I’d been so close to freedom. Sam had set me up, stacking the odds against me with the sheer number of werewolves in attendance. Why would it have to be the very last one I saw that sent a bolt of lightning right into my stomach? Was it too much to ask for just one break in my life? Author Bio: Melissa Haag lives in Wisconsin with her husband and three children. An avid reader she spent many hours curled in a comfortable chair flipping pages in her teens. She began writing a few years ago when some ideas just refused to be ignored any longer. 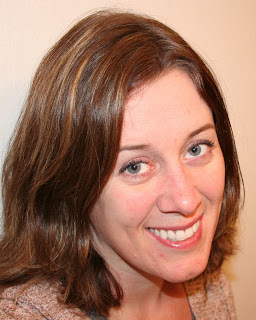 Touch, released in January 2013, is her first published novel. 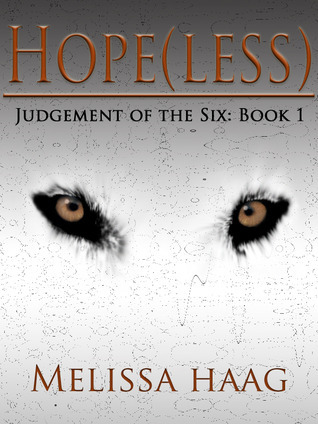 Hope(less), the first book in the Judgement of the Six series released in March 2013, is her second published work. Head on over to Melissa's Facebook page to enter her eBook GIVEAWAYs! What I say: I really enjoyed Gabby's story in Hope(less) and found her to be and interesting and stubborn MC. Gabby has secret abilities which allow her to see peoples colours or auras (lifeforce). Something about her acts as a super pheromone and she literally attracts all types of men in an obsessive and sometimes scary manner. This super attraction has caused her to become a loner and really nervous about being touched. The story begins with a parentless Gabby living with her most recent foster parents, until she meets the werewolf Sam. Sam instantly recognises Gabby's abilities and informs her of the secret supernatural world. Her unique abilities make her compatible with werewolves and highly in demand as such Sam takes her under his wing, introducing her to werewolf society and becomes a sort of Grandfather type figure to her. Even though she is REALLY against the idea, Sam constantly tries to find Gabby a mate. As there are not many female werewolves the competition between the males is fierce. Gabby meets the loner and non-pack werewolf Clay. They have an instant cosmic connection which Gabby is desperate to avoid. This causes some hilarious scenes as Clay often takes everything she says literally. I really liked Clay! For such a fierce guy he has the patience of a saint when it comes to Gabby. She's often mean to him, ignores him and constantly tries to fight their connection - poor guy! For most of the book Clay doesn't speak to her, and spends a lot of it in wolf form, living as a pet with her and her unsuspecting roommate. I appreciated how Clay had to work hard with Gabby. It's not all insta-love because she's so reserved around men and really struggles with trust. This is why the relationship she builds with Clay the wolf-dog is really sweet; she gets to know him in a non-threatening manner. It's not all easy romance as there are many challengers who are out to claim Gabby and her powers. Haag also provides hints of a love rival (I personally really liked Clay and hope the series doesn't go down the triangle route). Haag has left a lot of unanswered questions and there is a lot more to come in the series. I look forward to reading the next instalment. When he stepped behind the trees for a moment and reemerged completely naked, I began to think he might have more serious problems than dementia. He pulled me in and the force of it consumed me. He represented a hot fudge sundae to a diet-starved girl. Screw Nature. No way would I be even remotely interested in someone old enough to be my father. Especially when I had no clue who my father was.